“GO ON then, let’s get it over with,” muttered Paul Broadhurst to the waiting press pack. It wasn’t exactly the normal opening exchange for a player sharing the lead with a round to go. In fairness to the Englishman, though, he had cause to feel a tad frustrated after his second circuit in the Prostate Cancer UK Scottish Senior Open at Archerfield Links. Making his debut on the over-50s circuit, the former Ryder Cup player was making the Royal & Ancient game look ridiculously easy as he covered his opening 11 holes on the Fidra Course in seven-under-par to hold a three-shot lead in the £250,000 tournament on the East Lothian coast. As the fickle nature of the sport reared its head, however, he dropped four shots over the closing four holes to open the door for a whole host of players, including a posse of Scots, to still be in with a chance of landing the title in what is shaping up to be an exciting denouement at the event’s new home. On a leaderboard that shows no less than 11 players covered by only two shots, Broadhurst is tied at the top with St Andrews-born Gordon Manson (70) on three-under, one in front of Anglo-Scot Bill Longmuir (70), Australian Peter Fowler (68) and Canadian Ken Tarling (68). Two other home challengers, Gordon Brand Jnr and Stephen McAllister, are a further shot back in a group that also includes 1994 Scottish Open champion Carl Mason and Spaniard Santiago Luna, winner of this event at Fairmont St Andrews two years ago. In conditions that were, if anything, only marginally easier than the opening day due to a buffeting breeze sweeping towards the Firth of Forth, Broadhurst ignited his bid to become just the sixth player to make a winning debut in a regular Senior Tour event with a burst of four birdies in a row from the 12th. The Midlander admitted picking up shots at both the 14th and 15th had been a bonus, as was the 2 he made at the 17th to turn in 31 before starting for home with two more birdies. “I played lovely for 14 holes but then, oh dear,” reflected Broadhurst of a round that started to take a turn for the worse when he failed to get out of a fairway bunker and dropped a shot at the sixth. He then ran up a double at the next following some tree trouble, before finishing with a bogey after a blocked tee shot at the ninth. “Those last four holes are hard to take, but I’ve got to try and forget them and try to find the magic again tomorrow,” he added. While he has lived and worked in Austria for more than 30 years, Manson said he is “feeling at home” this week due to the fact he can occasionally catch a glimpse of his beloved Fife in between shots. “The course is nice but the special thing about playing here is you can see the Kingdom,” said the 56-year-old after bagging five birdies in his second round to give himself an excellent chance of following up a maiden Senior Tour victory in Switzerland earlier in the year. 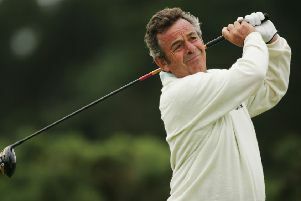 McAllister, a two-times winner on the main European Tour 25 years ago, is chasing a first victory on the over-50s circuit. “Whether it’s a bounce game or an event like this, I still have a bug for winning,” said the 53-year-old from Paisley, whose best effort to date was a share of fourth in Bad Ragaz in Switzerland three years ago. He’s hoping his experience of playing both this course and the neighbouring Renaissance Club can give him an edge in the final circuit. “This is a grinding course due to it having a lot of difficult slopes and a lot of the guys don’t play that type of course too often,” he added.